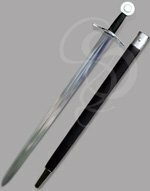 One of our most popular swords--the Knight Protector--is now available as a stage combat weapon! How does this version differ from our regular version? Glad you asked, you imaginary customer in my head! This version has thicker edges for strength in blade to blade combat, a rounded tip for extra safety, and non-coated metal fixtures to prevent chipping. 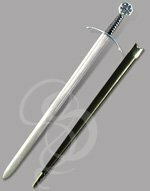 It's a little heavier than the original version, but, other than those differences mentioned, it's identical to the beloved knight protector sword. Note--the edges will nick on blade to blade contact, but the sword is built to weather these blows. 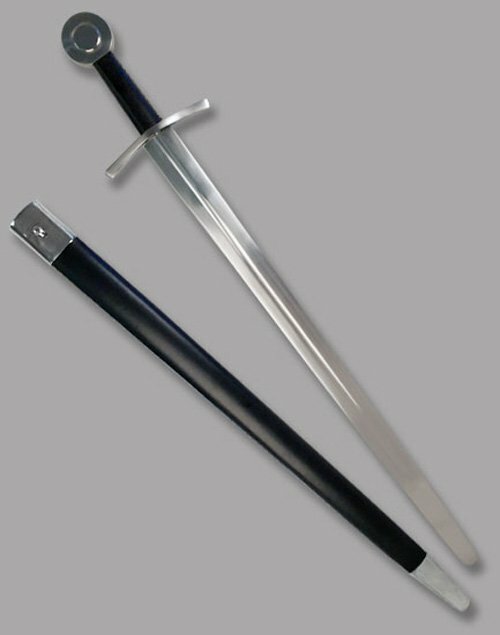 The blade on this sword is made is made from tempered high-carbon steel. 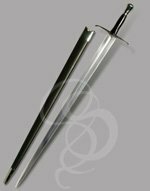 A central fuller spans the center of the sword, giving strength and reducing weight. The grip is made from hardwood and wrapped in black leather. The perfect item for any performance requiring a medieval sword. 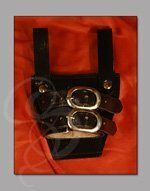 Includes leather-wrapped wood scabbard with chromed steel throat and tip. This was my first sword, it’s awesome. Highly recommend this sword.